What is meant by the term mediation? clarifying opposing positions and interests (reorganization, team collaboration, leadership challenges, strategy definition, …). The mediator supports the parties to the conflict in reaching a mutually agreed and sustainable agreement that takes into account the needs and interests of both parties. Business mediation accompanies companies in change processes and supports a sustainable corporate culture. Basically, the mediation process can be used in all conflict situations or for decision-making in complex situations in which the parties want a friendly solution. The mediation person’s compensation is usually in the hourly or daily fee. The duration of the mediation depends on the complexity of the case and the willingness of the parties to negotiate. According to surveys of the professional associations, the average mediation is around 5 hours. Usually, the costs are borne in equal measure by both parties. Deviations are possible by mutual agreement. Some of the costs are covered by legal expenses insurance. What does a mediation offer? Company mergers / mergers, change of management structures, structural adjustments, succession planning: Companies are to remain competitive in the long term. It is required to adapt structures on an ongoing basis. Structural adjustments are usually accompanied by organizational projects, new management structures, role clarification and task clarification, team building. Poor or unclear communication, mutual incomprehension for the behavior of the other or different ideas on work results, goodwill, etc., can impair mutual understanding and paralyze work ethic. Mediation helps you to identify and address the unspoken. In addition you will be able to promote an understanding of the interests and needs of all involved parties. They jointly define goals, that are important for all organizational parts and establish a new basis to work together in the long term. Teamleaders and employees do not have to be best friends. But in everyday work they should have and live mutual respect and trust. This is the only way to collaborate successfully – in the long term. Mediation enables this mindset and accompanies conflict situations neutrally, taking into account interests of all involved persons and roles. 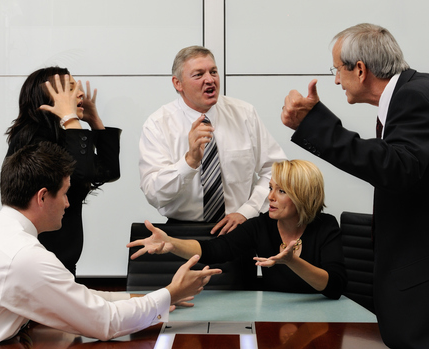 Conflicts within teams or between employers and teams usually have a variety of backgrounds. Maybe a team member does not act the way the team defines roles. Maybe the work efficiency of one team member is not the same as that of the other team members and has to be absorbed at the expense of others. Mediation supports conflict clarification and accompanies the successful clarification process.